Home > Holidays & Events > Are Christmas Clubs Worthwhile? With Christmas 2009 fast approaching, UK savers are already being urged to plan ahead for Christmas in 2010, if they want to make the most of the festive season. The recession may be nearly over, but for the UK economy, the next year could still be a depressing one, with more redundancies and higher inflation. So, for many people on a tight budget, the best way to plan ahead for next Christmas is to start saving now. The demise of Christmas savings club Farepak in 2007 left thousands of people out of pocket at Christmas. Government legislation has cleaned up the Christmas club industry, which is now governed by the Christmas Pre-Payment Association (CPPA). But are the savings accounts they offer the best way to save for Christmas? Christmas Clubs – are they worthwhile? The concept is a simple one. You open a savings account, which you are expected to pay small amounts into on a regular basis (usually either monthly or weekly). Then, as Christmas approaches you get the money back to spend as you wish. Or do you? The main problem with Christmas savings clubs are that they are uncompetitive and offer little value for money. There’s nothing wrong with the idea of putting some money away on a regular basis to save for the end of the year. However, some savings clubs offer little financial incentive to get you to give them your money. Take the savings scheme of one of the four main supermarkets. It recommends customers make payments onto a savings club card each time they visit the store. Then, in mid-November the club pays its savers a £6 bonus to any customer with more than £140 saved. Customers with less than £140 but more than £90 earn a bonus of £5 and so on down the savings scale. Sounds good? For starters, the bonus works out as an annual interest rate of just 4.2%. You would be better off paying into a cash ISA instead. The second major problem with this store’s savings account is that you have to spend all your savings within that store. It is essentially the same as swapping cash for gift tokens – the monetary value is the same but you are given a less flexible option of what you can spend your savings on, and the money is going straight back into the coffers of the store that gave you the savings card in the first place. A neat trick from their point of view. Most high street banks have been quick to get in on the act also. Most have adapted traditional savings accounts and lowered the standard monthly minimum payments to make them more appealing to lower paid savers. Unfortunately, they have lowered the rate of interest payable on the accounts accordingly. Worse still, if you opt to take money out of the savings account before the accepted withdrawal date, chances are you’ll be penalised with a much lower rate. 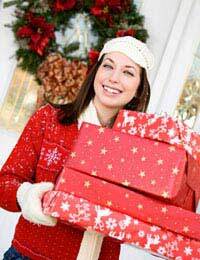 If you are keen to spread the cost of Christmas then a savings account is the best way to start. Just remember that Christmas club savings accounts may not be the most value, especially if you choose one from a supermarket that will expect you to use the money in their stores. Think about the amount of money you want to set aside each month and shop around for the best deal.